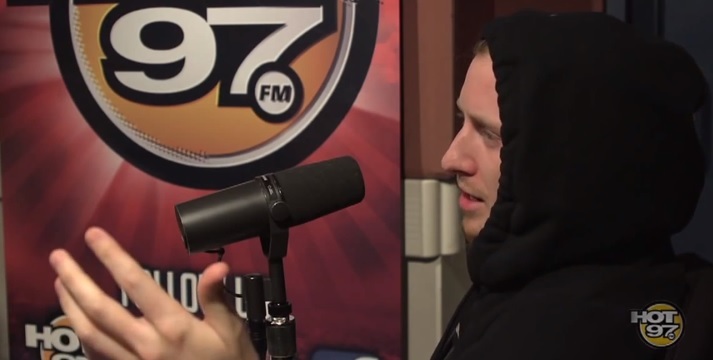 Peter Rosenberg and Cipha Sounds link up with Asher Roth on the latest episode of Juan Epstein. The main topic of discussion in the clip revolves around Eminem’s bars he aimed in Roth’s direction after feeling like the “College” rapper took a few subliminal jabs on a past song. The hosts and Asher also share a few laughs when they look back on JAY Z’s verse for Kanye West’s “Monster.” Watch as Rosenberg and Cipha explain to listeners why they find the first few lines of the song to be comical plus much more. This entry was posted in In The Studio, Interview, Video and tagged asher roth, eminem, hip hop, Interview, juan epstein, MMLP2, radio, rap, rap god. Bookmark the permalink.